They were two of the greatest distance runners in Memphis sports history. And on May 6, 2004, they met at the Rhodes College track to run one last mile. Both runners were long past their prime. They were both in their sixties, but only their grey hair evidenced their age. They appeared as trim and fit as they had been nearly fifty years earlier when they sprinted on cinder tracks in high school meets. There was no one in the stands that day at Rhodes College to watch these two legendary runners. There should have been, but the only two people in the world who knew that this race was going to take place were the runners themselves. And they wanted no spectators. They chose to run together that day to commemorate the accomplishment of another runner … one who had inspired them a half century earlier. That runner was a British medical student named Roger Bannister, and on May 6, 1954, he had done something that had never been done in human history. He had run a mile in less than four minutes. He had accomplished this historic feat on a cinder track at Oxford University. His run had not been televised. There was no ESPN in those days. There was no ABC’s Wide World of Sports. It wasn’t even shown on the network nightly news programs. But somehow back in West Tennessee, two young high school runners quickly learned about the medical student’s race on the other side of the world. In fact, they had been anxiously awaiting it for months. They had followed not only Bannister’s races, but also those of two other runners – John Landy of New Zealand and Wes Santee of Kansas, as all three runners had sought to be the first person in the world to break the 4 minute barrier. When these two young runners heard the news of Bannister’s historic run, they were thrilled … and inspired. They literally followed in Bannister’s footsteps. One of them went from being the fastest kid in Brownsville, Tennessee, to the fastest miler in the southeast. He went to the University of Tennessee where he was an all-American and set the SEC record in the mile. 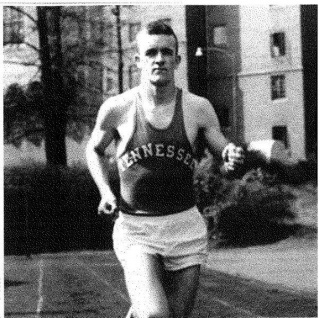 The other young man traveled a shorter distance … from East High School to Southwestern College, and there he too ran the fastest mile in school history and became a Memphis running legend. Along the way, they competed against one another in races. More important, they became close friends who ran literally thousands of miles together. And so on May 6, 2004 – fifty years to the day of that run by a British medical student – they met again at the Rhodes track. And there they ran side by side for four laps – one mile – in memory of an exciting day in their lives and the lives of all distance runners. They were Ed Murphey and Mike Cody, and just as Roger Bannister motivated them in 1954, they too inspired so many Memphis runners along the way. Ed died last week at the age of 78. He will be missed by his buddy Mike and by so many of us who were blessed to share a life on the run with him. We will never have his speed or his heart, but we will share his spirit on many wonderful occasions when we lace up our shoes and head out the door for a run. essay editing service reviews: Christmas is great festival for Christians. They enjoy a lot at this festival. They enjoy with their family by eating tasty dishes. They decorate their homes or streets very well. We can see amazing Christmas tree that is beautifully decorated and attracts visitors. Debbie Kerns: Inspiring story! Thank you for sharing. buck wellford: Nice article Bill.